You’ve arrived! 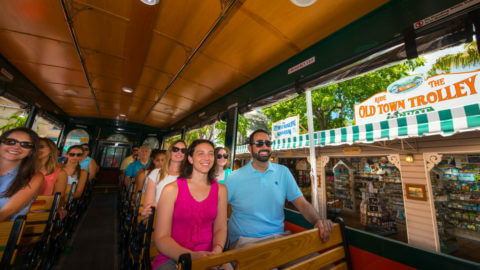 Now, get the insider’s view of the city aboard Old Town Trolley! We’ll take you to all the best spots first, giving you the most comprehensive sightseeing experience in St. Augustine. The Old City is full of fun and exciting things to do. From the Fountain of Youth to quaint St. George Street, our St. Augustine tour takes you to all the major neighborhoods and attractions. Old Town Trolley Tours has the largest fleet of trolleys in the city! So when you hop off, spend a few hours (or even just a few minutes) at any of the stops, you won’t have to wait too long for the next trolley. Less waiting time = More sightseeing time! With our use of clean burning propane, we’ve been committed to preserving and protecting the environment since we began delighting guests across the United States with our wonderful brand of Transportainment™. We want you to make the most of your St Augustine vacation, so we’ve come up with a tool that'll help you plan before you go and discover even more once you get there. Our easy-to-use interactive map will help you maximize your Trolley Tour experience, so you won’t miss all the excitement that St Augustine has to offer! And since it works great on mobile devices, you'll have all the information you need during your trip, right in your pocket. December 24: Last tour is at 3pm. December 25: Closed. For more information, go to Old Town Trolley schedule. All schedules are subject to change. Please call (904) 829-3800. Tours depart nightly at 8pm. Dece. 24-25th, July 4: Closed. For more information, go to Ghosts & Gravestones schedule. December 24: Last tour is at 3pm.